During the second week of Always In The Kitchen, we’ve chosen Bent Van Looy and Martena Duss as the chef de partie, the curators for the visual art section. He’s a musician and visual artist, she’s a creative entrepreneur. Both share interest in visual art as well as various off-track challenges in which they can combine their refined knowledge and versatile skills. Now they’ve gathered a selection of young, committed visual artists after having visited art schools and ateliers, or via contacts in their personal or mutual networks of artists. The result of this spontaneous selection happens to offer a kind of overview of what’s trending lately in the art world. 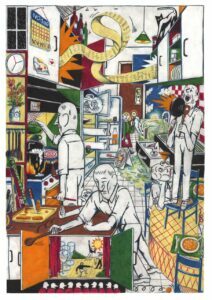 With the kitchen as the umbrella theme of the festival, Van Looy and Duss draw upon its natural, lively energy. The kitchen is alive and acts as a central hub embracing everyday life, no matter how heavy or bright life can be. Instead of the usual objects on the kitchen counter, sauce stains or jackets and shoes on the floor, they put forward a combination of works which are either already made or specifically created for cupboards and fruit bowls. As the artists challenge and make us revalue or appreciate that living space in another way, the exhibition hovers from subtle notes of humour and surrealism to innovating works, unexpected or poppy momentums and explosiveness. Participating artists are Nel Aerts, Ruben Bellinkx, Kasper De Vos, Niels Goos, Viktor Hachmang, Kate Isobel Scott, Stephane Kozik, Kim Noble, Charline Tyberghein, Domas van Wijk and Tom Volkaert. Tumult.fm also came by and talked with Bent Van Looy, Martena Duss, Domas van Wijk and Stephane Kozik about the eclectic selection of artists in the blank canvas alias kitchen and the artistic interventions they hope to realise. The wonderful photographer Michiel Devijver commemorated the evening on camera. Relive the opening, or have a look at the exhibition. Entrance to the kitchen expo is free. Go to the facebook event for more updates.